Mr. Jose Luis U. Yulo, Jr. is currently the President of the Chamber of Commerce of the Philippine Islands, the first and the oldest business organization in the country. He co-founded and managed the first trade exhibit center of the country – the Philippine Center for International Trade & Exhibits. 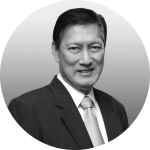 His civic involvement & positions include being the co-founder & former president of the Philippine Chamber of Commerce & Industry, Secretary General of the ASEAN Chambers of Commerce & Industry, and co-founding chairman of the APEC Business Council. He served as President & CEO of the Philippine International Trading Corporation and later became the President & CEO of the Philippine Stock Exchange, to name a few. He also served as Consul-General, ad honorem of Slovenia in the Philippines.